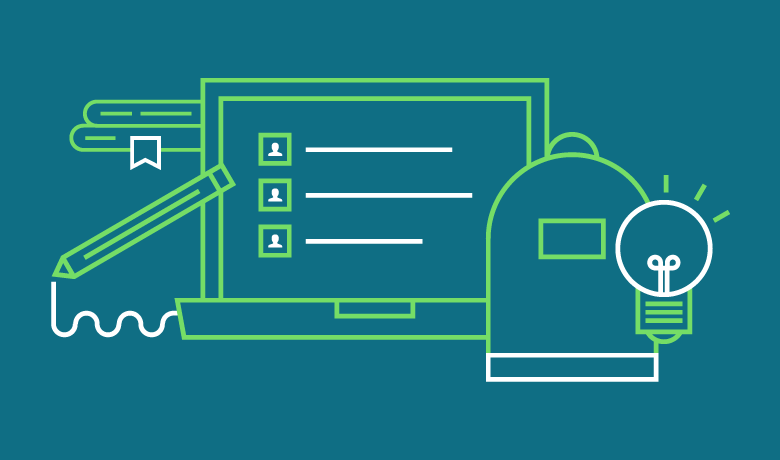 Here at AWeber, we dedicate ourselves to ensuring small businesses owners and entrepreneurs like you have everything you need to be successful with email marketing. As part of this mission, we feel just as strongly about empowering future generations to pursue careers in Science, Technology, Engineering and Math – this way, they can continue to do amazing things for people launching their own businesses, too. That’s why we led a program to help educate kids in the local community about the real-life application of these skills, as well as what it’s like to work within a tech company. Ready to get a behind-the-scenes look into how we made this possible? Read on! 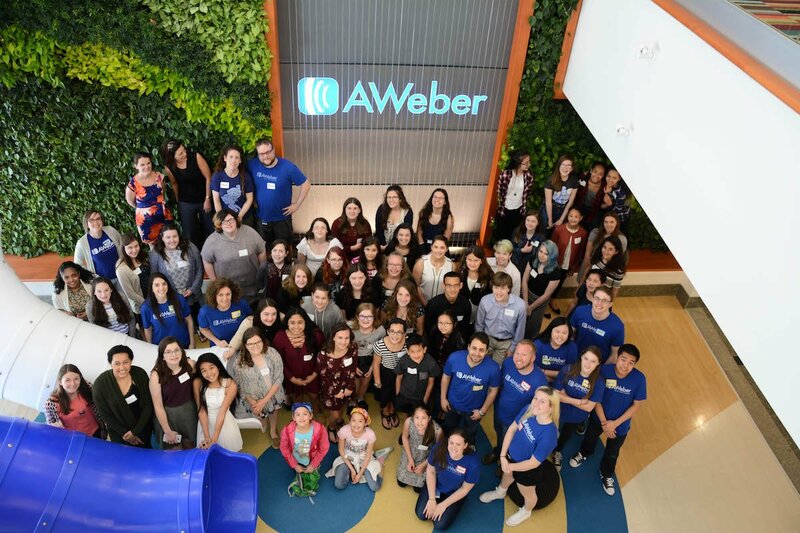 A few months ago, one of our AWeber team members, Jason D., had a simple idea: to create a learning opportunity for students that would inspire them to work with technology and/or pursue a career in STEM. We immediately turned to our friends at one of our local school districts in Souderton, PA to see if they were interested in partnering together. Luckily, they were ecstatic! Within no time, we were brainstorming ideas to bring it to life. As we thought about ways to educate students and introduce them to the fields of Science, Technology, Engineering and Math, we realized we also wanted a program that could be repeated and shared with even more kids again and again. That’s when we landed on a Tech Girlz curriculum, “Developing a Mobile App.” Through this program, students would learn how to brainstorm an idea for an app, identify personas, create a prototype and present it to others. 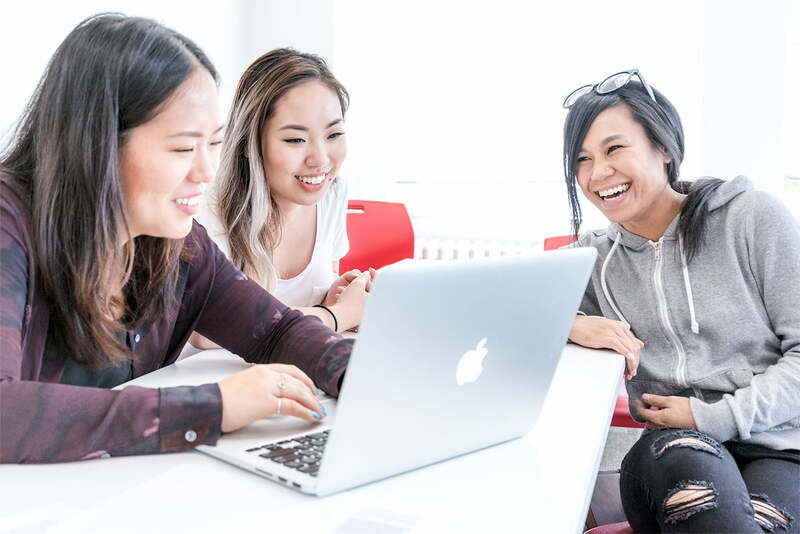 “We specifically chose the TechGirlz course for “Developing a Mobile App” because it allowed us to demonstrate the broad range of expertise that goes into building a type of ‘tech’ that is very familiar with today’s students, “ Jason said. And since building apps and other software is a normal AWeber day for us, we decided to add our own spin to it by incorporating things like user experience and sprint planning. “Having AWeber team members involved who are experts in the different submodules of the program ensures that students are learning the latest and greatest proven techniques and skills that are directly applicable in the real world today,” Jason added. After determining that this program would be best for students in fifth through ninth grade, we were on the hunt for co-facilitators. How could we get older students involved and excited about tech, too? That’s when our friends at Souderton School District recommended we team up with five high school students to help facilitate. Sure enough, we had five eager and passionate volunteers sign up! “Partnering with the high school students was a great way for us to take our efforts and have them multiplied, since these students will be facilitating this program in the next school year for the Souderton middle school students,” said Jason. Plus, it gave these high school students an opportunity to lead and mentor others. Over the course of two months, we coached and mentored these students on the mobile app program. We met weekly to review each module, brainstorm team exercises and provide individual coaching so they were knowledgeable and comfortable developing mobile apps. We were proud to see these five students grow more confident and go outside of their comfort zones. On top of that, we found ourselves growing as well! It was inspiring to work with students who were so open to learning new things and making a difference. On April 28, the five high school students (along with a handful of AWeber team members) led a group of 52 children (50 of which were female) from fifth through ninth grade. Within four hours, the students brainstormed prototypes for eight mobile apps and learned about agile and sprint planning. After choosing an idea, they brought it to life with sketches and the mobile prototyping app, Marvel. They then presented each app to one another and had a chance to get a real-life understanding of the different roles within a tech company. Best of all? The kids were able to see that a future career in tech is more within reach than they had imagined. Everyone had a blast that day, and it was inspiring to see the excitement in our high school students. They can’t wait to implement the program in their middle schools – and we can’t wait to see them spread the STEM love! Wanna work with a team that not only supports small businesses around the world, but the local community as well? Learn more about career opportunities at AWeber today!